The subject property is approximately 11.1 acres in size located in north San Rafael. The subject property consists of two separate parcels bisected by Los Gamos Drive. APN 165-220-13 is a 178,160-square foot parcel previously developed with an existing approximately 148,000 square foot office building and associated surface parking. Across Los Gamos to the west is APN 165-220-12, a 305,791-square foot parcel developed with an approximately 80,000 square foot terraced surface parking lot and landscaping. The remainder of this parcel is characterized by oak woodland. 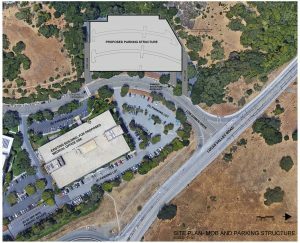 Amendment to the current Planned Development (PD) zoning to add medical office use as an allowable use in the PD and allow the existing 148,000‐gross square foot office building, located at 1650 Los Gamos Drive in San Rafael, it to be utilized as a medical office building (“MOB”). The construction of an up‐to 511‐space parking structure on the existing surface parking lot located to the west of 1650 Los Gamos Drive that will primarily serve the Kaiser Permanente employees working at the MOB (“parking structure”). Continued use of the 42 existing parking spaces located adjacent to 1650 Los Gamos Drive, on the 1600 Los Gamos Drive property. Kaiser Permanente has legal access to the use of those parking spaces through an easement and is not proposing any changes to the parking spaces. Both 1650 and 1600 Los Gamos Drive were originally developed pursuant to a single PD District, which permits 1650 Los Gamos Drive to be constructed with up to 150,000 square feet of office uses and 1600 Los Gamos Drive to be constructed with up to 340,000 square feet of office uses. 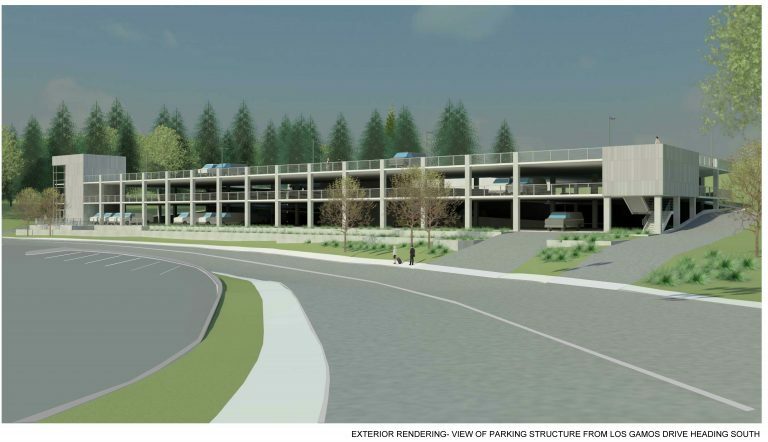 To provide adequate parking for the use of the Medical Office Building at 1650 Los Gamos Drive, Kaiser Permanente is proposing to construct a new up-to 511‐space parking structure on the site of the existing surface parking lot to the west of the existing building. Discretionary approvals or permits needed to construct and operate the Project will include: 1) an amendment to the existing PD District for the site to (i) allow medical office uses at 1650 Los Gamos Drive in addition to existing office uses, and to (ii) separate the PD District from 1600 Los Gamos Drive, except for the surface parking area covered by an easement; 2) a Master Use Permit Amendment; 3) a Major Design Review Permit; and 4) a Sign Program. Additional approvals may be required from the County of Marin and the California Department of Transportation (Caltrans), as responsible agencies, to allow for any project mitigations identified within their jurisdictional boundaries. Approvals from the Las Gallinas Valley Sanitary District will also be required to relocate the sanitary sewer line. Other responsible agencies and additional approvals may be identified through the environmental review process. The proposed project would result in significant adverse impacts upon traffic and circulation due to the proposed requirement of a major intersection improvement. In addition, because a comprehensive analysis of potential environmental impacts has not yet been undertaken, the proposed project could potentially result in impacts to Air Quality, Greenhouse Gas Emissions, Land Use and Planning, Noise, and Traffic and Transportation. These thresholds will be further discussed in an Environmental Impact Report (EIR) and mitigations will be identified, analyzed and implemented to the extent feasible to reduce potential environmental impacts to less than significant levels. The Initial Study document has been prepared in consultation with local, and state responsible and trustee agencies and in accordance with Section 15063 of the California Environmental Quality Act (CEQA). The City has commenced its environmental review for the project, consistent with the California Environmental Quality Act (CEQA) guidelines. The first step was to prepare an Initial Study to evaluate the project's potential impacts on various facets of the environment. An Initial Study was prepared consistent with CEQA requirements. The Initial study concluded that the project the proposed project would result in significant adverse impacts upon traffic and circulation due to the proposed requirement of a major intersection improvement. In addition, because a comprehensive analysis of potential environmental impacts has not yet been undertaken, the proposed project could potentially result in impacts to Air Quality, Greenhouse Gas Emissions, Land Use and Planning, Noise, and Traffic and Transportation. These thresholds will be further discussed in an Environmental Impact Report (EIR) and mitigation will be identified, analyzed and implemented to the extent feasible to reduce potential environmental impacts to less than significant levels. Based on the Initial Study, the City has prepared a Notice of Preparation (NOP), which is the first step in an EIR process. The NOP is a scoping process to confirm the scope of the topical areas to be covered in a Draft EIR. There is a thirty-day (30-day) public review period for the NOP, which commenced on June 9, 2017. The City of San Rafael Planning Commission held a public scoping meeting to solicit comments on the scope of issues to be addressed and alternatives that should be considered in the EIR on June 27, 2017, 7:00 PM. A copy of the Initial Study as well as the technical appendices are provided on this page. A Draft EIR has since been completed and released for a 45-day public review period on March 9, 2018. The 45-day period will conclude on Monday, April 23, 2018 at 5pm. During this time, the City will accept written comments on the adequacy of the DEIR. The Planning Commission will also conduct a public hearing on Tuesday, April 24, 2018, at 7pm in the City of San Rafael City Council Chambers, to consider the adequacy of the DEIR, as well as accept any oral comments. A copy of the DEIR as well as the technical appendices and Notice of Completion are provided below on this page. The Final EIR (Response to Comments) was prepared and released for public review on August 10, 2018. The project was noticed on August 10, 2018 for the August 28, 2018 Planning Commission hearing to review the FEIR and the merits for consideration of a environmental design, use permit, zone change, and sign program amendment. On February 21, 2017, formal applications were submitted to the City for the proposed project. The City has reviewed the project plans and studies to review and understand the project scope and determine completeness of the application. The applicant conducted a Neighborhood Meeting in late 2016 and August 28, 2017. The purpose of these meetings was for the applicant to present the project to the community, answer questions and solicit feedback on the application. This neighborhood meeting was conducted at the site. This was not a city sponsored meeting, but rather a meeting the City requires that applicants for large development proposals conduct to present their project to the community, answer questions and solicit feedback. The City was in attendance to take notes on the comments. Approximately 20 persons were in attendance at both meetings. This project was reviewed by the Design Review Board (DRB) as a conceptual review on September 6, 2017. Public comments were accepted and the DRB provided feedback on the conceptual design of the proposed new parking structure. The Draft Environmental Impact Report was prepared and released for public review on March 9, 2018. The DEIR public review and comment period ended on April 23, 2018, concluding on April 24, 2018 at the Planning Commission meeting. The City received 13 written comments during this review period. Six individuals, including the six Planning Commissioners, for a total of 12, provided verbal comments at the Commission hearing. The project design was reviewed by the Design Review Board (DRB) on three occasions, once as a conceptual design and twice (May 22, 2018 and again on July 17, 2018) as a formal application. At the July 17, 2018 hearing, the DRB provided a unanimous recommendation for approval to the Planning Commission with suggested minor modifications. The Final EIR (Response to Comments) was prepared and released for public review on August 10, 2018. The project was noticed on August 10, 2018 for the August 28, 2018 Planning Commission hearing to review the FEIR and the merits for consideration of an Environmental Design, Use Permit, PD Rezoning, and Sign Program Amendment. At the conclusion of the August 28, 2018 Planning Commission hearing, the Commission recommended approval of the project to the City Council through the adoption of Planning Commission Resolution No’s 18-05, 18-06, 18-07, 18-08 and 18-09. On September 17, 2018, the City Council conducted a public hearing on the project, accepting the recommendation of the DRB and Planning Commission. The City Council ultimately approved the certified the Final EIR, adopted Statement of Overriding Considerations for the significant environmental impacts, and adopted the PD rezoning for the subject property and the adjacent property at 1600 Los Gamos and approved the planning applications. The planning entitlements are not approved. The next steps in the project are for the applicant to apply for and obtain the required building permits (for the new garage and tenant improvements in the 1650 Los Gamos building) and improvements plan for the intersection improvements at Los Gamos Drive/Lucas Valley Rd. It is anticipated that construction will commence in Spring 2019 and be completed by summer 2020.